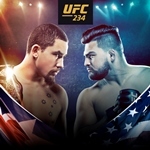 Two fighters with great stamina and ability to withstand hard blows will square off this weekend as current middleweight champion Robert Whittaker and Kevin Gastelum headline UFC 234, which will take place on Sunday at Rod Laver Arena in Melbourne, Australia. Although Whittaker is the favorite (-245) due to his elusiveness and overall good movement all around the octagon, Gastelum will present a very nice challenge that should produce a very entertaining fight. Whittaker, an Australian born in New Zealand, is likely to try to chop Kelvin down early and then try to hit him with long combinations later in the fight, hoping to land a blow that ends the fight with a KO or that will at the very least allow him to win on points. Whittaker should not hold back and give his maximum effort because if he lets his guard down, he could end losing this fight. Gastelum knows how to fight and maximize his boxing and wrestling skills to defeat his opponents. He thrives managing his energy and stamina amid the chaos of a UFC fight more than others. He has the ability to remain calm and show enough composure to outlast opponents that exert more energy than him. As a result, Gastelum can frequently reach the late part of fights fresher, which allows him to occasionally take a punch like few can and then counter to beat on his slower and more tired opponent. That, of course, will hardly be an advantage in this fight because Whittaker is not only a lot more experienced but also has great stamina. Whittaker has shown in several fights that he possesses consistent workflow and great pace, so he rarely displays signs of fatigue and has proven that he can go all five rounds in a title fight if necessary. Gastelum is a tremendous boxer with great grappling skills that can mix it up very well, and this should worry Whittaker, as he excels at stringing up combinations and finding a lot of opening on the inside to finish his opponents. If Whittaker gets reckless Gastelum has the skills and power to knock him out. The strongest part of the fight for Gastelum will be early on, when he has all the speed and will look to exploit his range to find an opening on the inside, but the longer the fight goes on the longer it will play on Whittaker’s favor. Whittaker‘s likely to win this fight, although not via KO. This due to the fact that Whittaker’s not a great power puncher and Gastelum has a great chin, so look instead for the Australian to win via a unanimous decision.